This healthy roasted dish is simple and full of amazing flavors. Roasted Brussel sprouts, acorn squash, red peppers with a sauce made from chickpeas, kale, lemon, garlic and sage with chia seeds and ground flax. Served with a side of wild rice topped with soaked almond slices. While you are preparing this dish. If you intend on pairing this with wild rice, now is a good time to start it as it takes 45 minutes to cook. Place a wet paper with extra water squeezed out and place on your cutting board. This will help the acorn squash from sliding around while you prepare it. Cut the bottom & top off your acorn squash and sit it upright on a cutting board. Using a sharp knife, cut the skin off in an arc-like motion. Like you would cut the skin off a grapefruit or large orange. Then cut it in half and use a large spoon to scoop out the seeds. Lay each half flat and cut into 1/2″ slices. Once sliced cut the strips into ½” cubes. Cut the Brussel sprouts in half lengthwise. Cut the red pepper into ½” pieces. Place the acorn squash, red pepper, and Brussels sprouts on a baking sheet. Bake at 425 degrees for about 20 minutes. NOTE: Purple Brussels are typically much smaller than green Brussels. If you are going to use the larger ones they will need to be baked 15 minutes longer then the acorn squash and red peppers. While the veggies are roasting, let’s prepare the sauce. Combine all the sauce ingredients minus the arrowroot/water mixture, in a small saucepan. Bring the sauce to a boil, then reduce to low and cover while the veggies are roasting. When the veggies are done remove from the oven and carefully place them in a large bowl. Re-mix the arrowroot/water and add to the sauce. It should thicken slightly. Stir the sauce in with the veggies. It is now ready to serve. 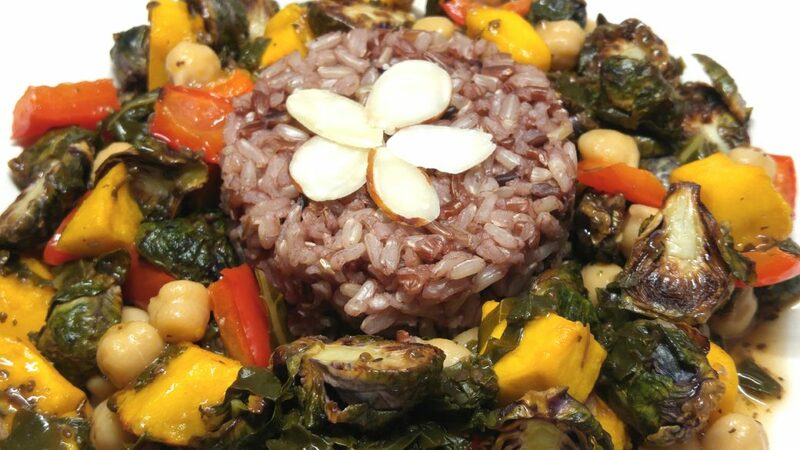 I paired this dish with wild rice and a raw side salad with my oil-free lemon Italian dressing.